Hey there, friends!! Tonight marks the June Inspiration week for Lawn Fawn!! As we noted last month, Lawn Fawn is now releasing their full season of stamps all at once...which was last month! 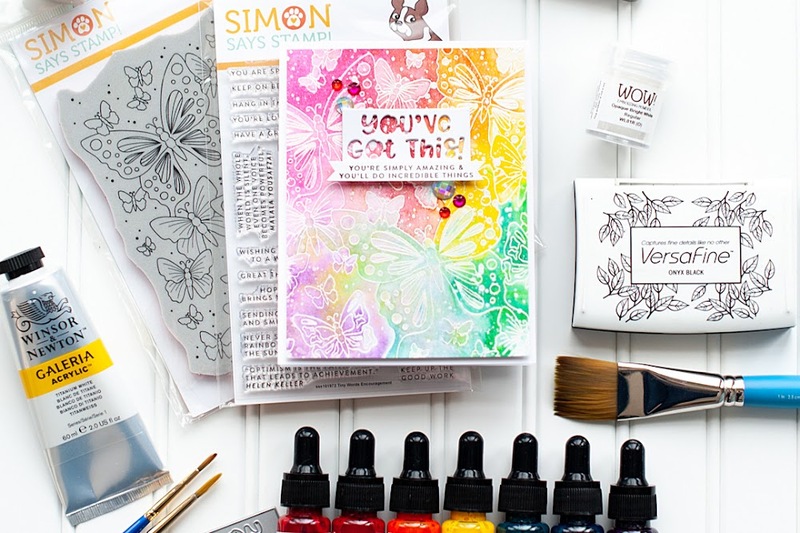 But, we are still doing an inspiration week every month, which will include never before seen projects using these new stamp sets!! Today we are featuring "On The Mend" which is an oh so cute set for all your get well wishes needs!! 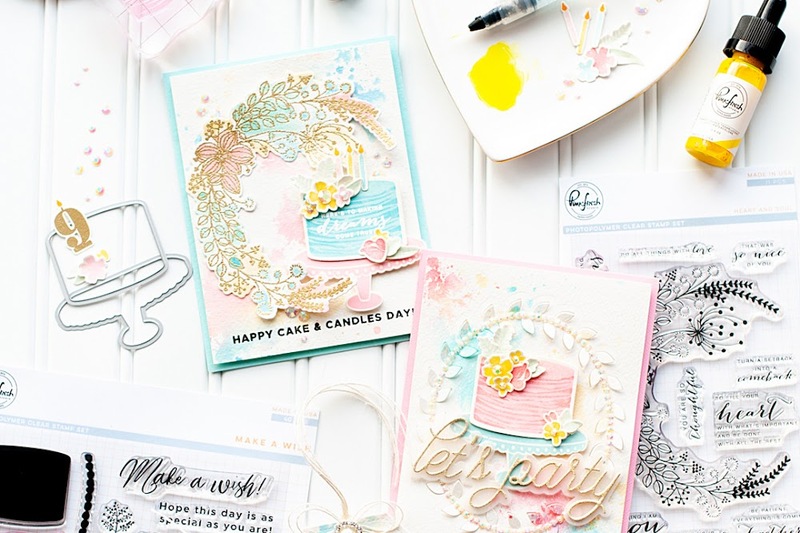 If you haven't already picked up the set, it has some of the CUTEST little images to go with some super sweet sentiments. It is definitely a must have, as it is one of the first cute get well stamp sets that I have seen! I created this for a couple of challenges as well! First up, I used Sweet Sunday Sketch #121 to help with the design of my card. The clean design yet fun elements really helped me showcase the stamp set well!! 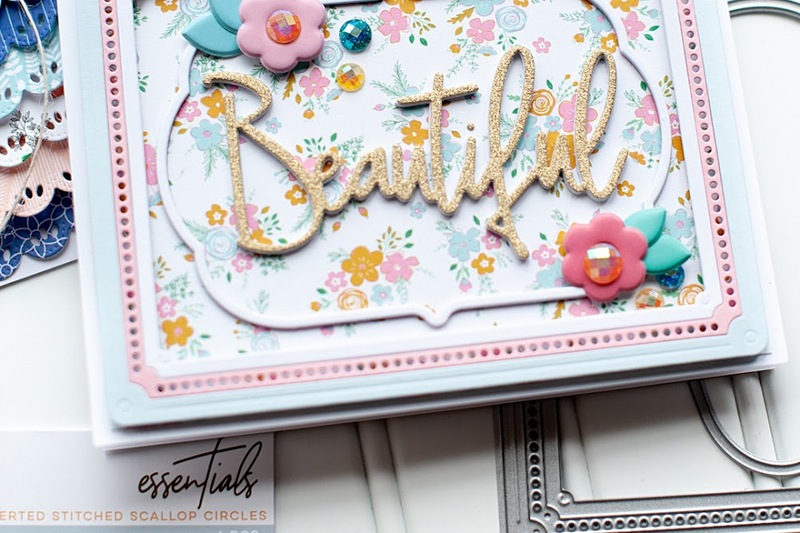 I also used Embellish's Background Stamping Color Trends Challenge for it, which allowed me to use Lawn Fawn's "Teeny Tiny Backdrops" set as well!! Here is what I created! Instructions: Make card from kraft cardstock, round the bottom corners, and stamp the heart background to it. Cut a scalloped circle from white grid paper at 3.5" using the Cricut Expression & Storybook cartridge. Cut a regular circle from green tablet paper at 3", and then layer with the scalloped circle. Adhere the entire piece to the front. Diecut and emboss the label from aqua dotted paper, and adhere to the card front, overlapping part of the scalloped circle. Cut two strips of patterned paper, layer together, and cut a banner shape to the end of it. Stamp the sentiment to the strip, and adhere to the card front. Accent the left of the sentiment with three jewels. Stamp the box of tissue to patterned paper and to vellum. Cut out the appropriate pieces, and then layer together to the top of the label cut. Squish three small strips of vellum into little wads and adhere around the tissue box. Tie twine through three buttons, and adhere below the tissue box. Tie twine around the top of the card, and cover the middle with a button to finish. Do you want to know what I love about this one? It has more purposes than just "Get Well". You could give this to someone who is going through a rough spot in their life as well. The tissue box stamp does have a smiley face inside of it...but I chose to mask it out on this one as it didn't seem completely appropriate. Masking it out was very easy...and I just put a little piece of tape of the spot, inked it up, and then took the tape off. Easy as pie!! Be sure to check out what the rest of the Lawn Fawn gals have come up with using "On The Mend"! What a great card! From the sketch, to the colors...perfection! 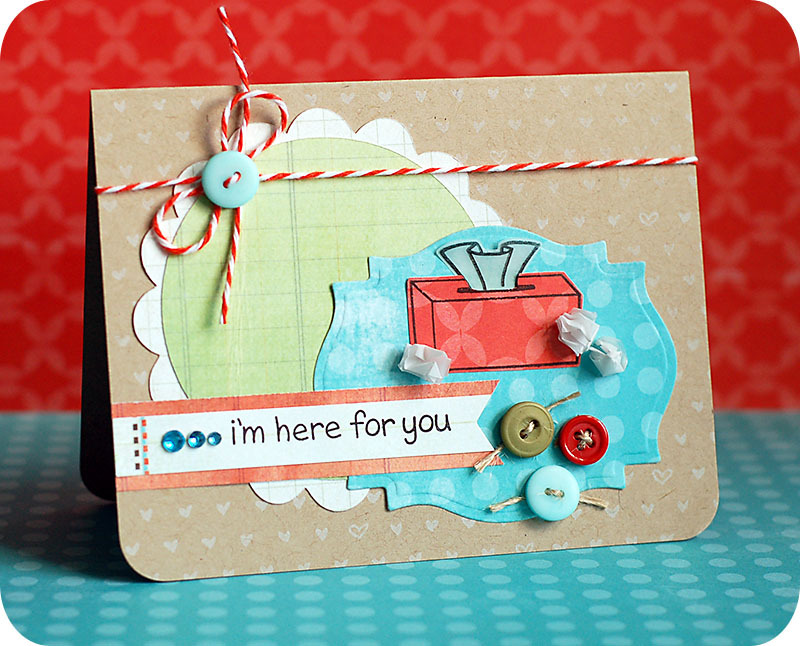 so many cute things about this card: the layering, the paper pieced tissue box and those adorable "wads" of tissues. just DARLING! So pretty! I love the lil' tissue papers wadded on the side of the box. What a great idea. Thanks for sharing. Is it wrong to think "used" tissues are cute? :) Well if it is wrong I don't care, I think they are very cute! Oh my, how cute is this card?! I love all the buttons you added, and that Spellbinder die is calling my name! Oh I love this card. I love that you masked off the smiley face and added some bunches of tissue to the bottom of the box. Today is going to be a tough day for me so I am going to pretend this card is for me and it cheers me up. Super cute. Love all the texture, the soft heart background and the addition of twine. Love it. OK you totally rocked the colours and the background but OMWord those little tissues are too cute for words!! !